Training packages. Practical skill-building training for self-study or in a classroom setting. Training DVDs. 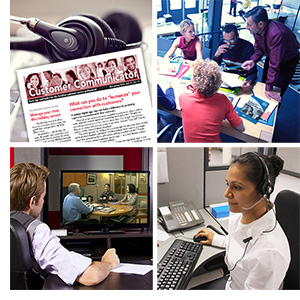 Information packed videos on essential service topics. Training newsletter. Monthly training and reinforcement to enhance service skills, morale, and motivation. Spotlight Awards. 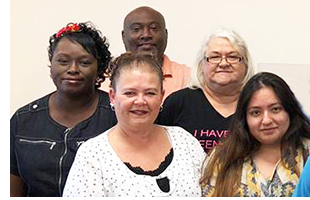 Honoring frontline reps who provide exceptional service to customers and coworkers. 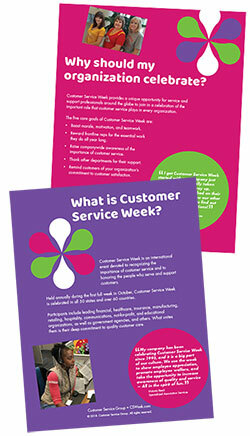 Keep the Customer Service Week message alive for the other 51 weeks with materials from Customer Service Group. We’ve heard from people around the globe, and seen many wonderful celebration photos. Now, we’d like to hear from you. Please share your photos, videos, and event details. We’ll share as many celebration stories and photos as possible via the CSWeek.com website, the Email Bulletins, and on Facebook. Check, check, check. As you’re checking off items on your Customer Service Week to do list, we hope you’ll add one final thing. We would love to hear about your celebration. 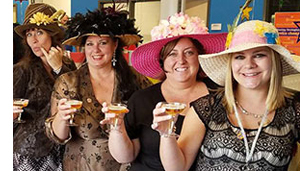 All of the ideas we’ve shared, starting way back in April, are based on celebrations hosted by our customers. So please share your photos, videos, and event details. 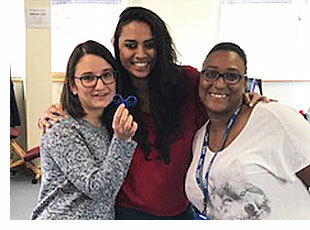 In turn, we’ll share as many celebration stories and photos as possible via the CSWeek.com website and in the Customer Service Week Email Bulletins. You may email us or post to the Customer Service Week Facebook page. We would love to know about each day’s activities and the moments that were the most special to your group, or just send photos. Please email me at mdalessandro@CSWeek.com. Seeing your event online is a great way to extend the celebration! Room Service. This year’s celebration at Penske Truck Rental will include a special breakfast. Prior to Customer Service Week, reps will receive a room service order form to make their beverage and cereal selections. Then everything will be delivered for an at-your-desk breakfast during Customer Service Week. Mini-food truck. A rolling cart, piled high with snacks and beverages will be making the rounds all week at Bedrick Press. Brown bag lunch. 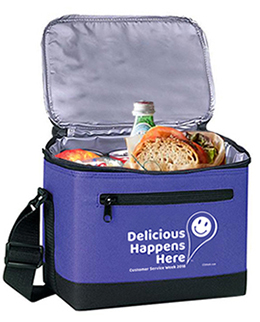 And at Allied Corp., Customer Service Week lunch totes will be filled with yogurt, fruit, cookies, and chips. Reps can pick up their Lunch Totes at any time during the day. If you need a few final celebration items, order today for delivery before Customer Service Week. Choose a theme. This can be a fun way to get everyone thinking about what to bring. Some popular themes are: Family favorites, crock-pot specialties, and savory soups. Create a sign up sheet. It’s the easiest way to ensure a nice variety of items. Include categories and quantities such as: Vegetarian entree for 6, desert for 18, and appetizer for 12. Remember the non-cooks. Be sure to include some no-cook options like green salad, a fruit platter, water bottles, and chips and salsa for people who don’t know their way around the kitchen. Label the food. 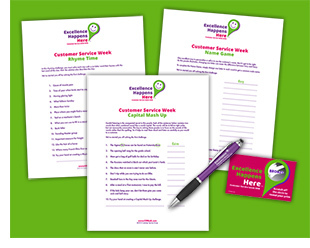 Print out Customer Service Week table tents and ask everyone to label their contributions. Don’t forget the essentials. Tablecloths, plates, cups, napkins, utensils, condiments, and anything else you can’t do without. Clean up. Provide plenty of bags and label them for garbage and recyclables. And, of course, no matter what food you serve, invite your team to take a few treats back to their desks in Customer Service Week Lunch Bags. Don’t delay, order your celebration materials today! A kick-off breakfast is the perfect way to start your Customer Service Week celebration. For many it’s the time to announce the theme, share the week’s agenda, and sign the Customer Service Week pledge. Oatmeal station. Healthy and warming on a cool October morning, try a crock pot filled with traditional or steel cut oatmeal. Then provide toppings such as milk, fresh and dried fruit, sugars, nuts, honey, shredded coconut, and maple syrup. Yogurt station. Include a variety of yogurt flavors plus toppings such as fresh fruit and berries, granola, nuts, and even chocolate chips. Baked goods station. For sweets lovers include muffins, croissants, and scones served with butter and jam, plus doughnuts, and bagels and cream cheese. 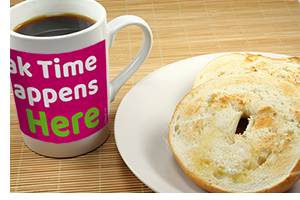 And, of course, no matter what you serve, invite your team to enjoy coffee or tea in Customer Service Week mugs. Posters to Pensacola, Balloons to Boise, Monitor Mirrors to Mineola. Plus Stress Balls to Belgium, Auto Mugs to Malaysia, and Coasters to Costa Rica. 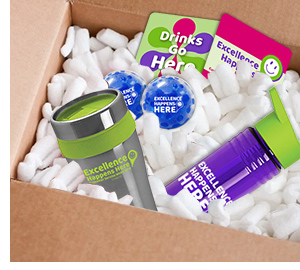 We are shipping around the globe so that you have everything you need for your Customer Service Week celebration. So don’t delay, order your celebration materials today! Need a few last minute ideas? We’ve got them. In fact, we’ve got 25 of them. But before you get started, why not place your Customer Service Week order, it really is getting late. Decorate the service center with Posters, Banners, Pennants, and Balloons. Start the week with a kick-off breakfast. At your breakfast, invite everyone to sign the Customer Service Week Pledge. 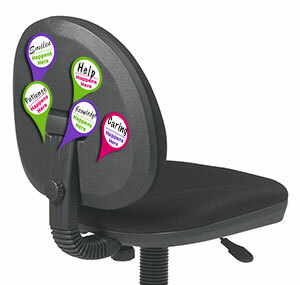 Give each person signing the pledge a Logo Pin as a reminder of their commitment to customer satisfaction. Recognize the individuals and groups that support your department. Present them with Certificates of Appreciation and include them in your celebration activities. Thank your customers and remind them of your commitment to customer service with personally signed Thank-You Cards. Make your Thank-You Cards more meaningful by enclosing a copy of your mission statement or a photograph of your service team. Thank frontline staff by sending personally signed Thank-You Cards to their homes. Solve at-your-desk puzzles throughout the week. At the website you’ll find pencil-and-paper puzzles you can print for everyone on your team. Award prizes to everyone who tries a puzzle. At the end of the week host a grand prize drawing from among the participants. Host ready-to-use activities. At the website you’ll find team-building, skill-building, and stress-relief activities. Host theme days with coordinated activities, food, and costumes. 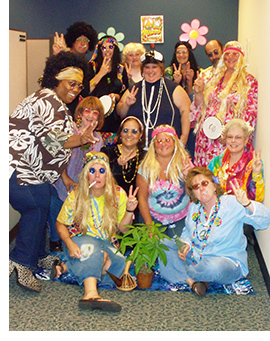 Some of the most popular themes are Stress Relief Day, Company Colors Day, Pajama Day, 60s Day, and Sports Team Day. Create games based on popular TV shows such as Amazing Race, Jeopardy!, Cash Cab, and Survivor. Recognize the service team for their hard work and dedication. Gifts with the Customer Service Week logo provide a year-round reminder of your appreciation. Host ready-to-use recognition activities. The website includes activities for groups of all sizes including an Opening Ceremony, Closing Ceremony, and Peer-to-Peer Recognition. Enjoy a festive meal or snack breaks such as a catered lunch, ice-cream sundae break, or cupcake and coffee get-together. Use our Cupcake Toppers to make ordinary cupcakes special. Make a special delivery. If your team can’t gather for a break, have team-leaders, supervisors, and managers make special deliveries to each person with a snack, token of appreciation, and words of thanks. 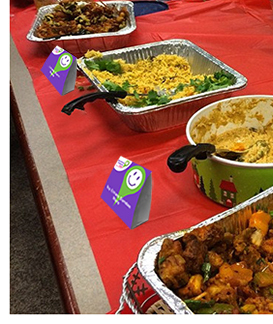 Include remote staff by sending celebration boxes with balloons, small gifts, and a photograph of your in-house team. Document the celebration. From simple photo backdrops to photo booths and custom selfie frames, everyone loves to snap a reminder of the celebration. Our print-and-use photo props make it easy. Share your celebration. From Facebook to Twitter and Instagram share your celebration on your organization’s social media channels. Incorporate a charitable element into your celebration. 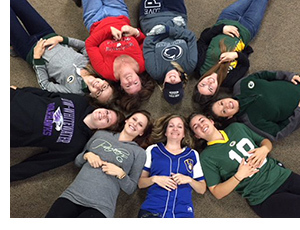 From fundraising to clothing and canned food drives a give-back activity is great for building team cohesion. Motivate with a personal address from your CEO, president, or division head, on the importance of service to your organization. Share the speech with in-house and remote staff via online video conferencing. Finish the week with a Closing Ceremony. Thank all of the people who gave their time and energy to make the week a success. Make your final prize awards. And then hang your Certificate of Participation. Have fun. This is the one week out of 52 to reflect on successes, celebrate accomplishments, and re-energize so that that your team can deliver the best possible service for the next 51 weeks. Whew! Now it’s time to order your celebration materials! As you’re wrapping up your celebration plans, I wanted to remind you of some of the many practical resources at the CSWeek.com website — eCards, organizer’s guide, sample agendas, plus all of the decorations, gifts, rewards, and stress relievers you need. 15 fun and useful printables including cupcake toppers, candy bar wrappers, placemats, table tents, and more. It’s never too late to plan a special celebration for your team. And our Printables make it quick and easy. So what exactly is a printable? It’s a document that you can print and use as many times as you like. 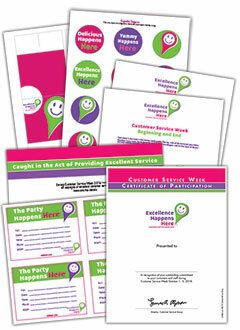 Each printable features the Customer Service Week logo, but best of all, printables are free when you order celebration materials from CSWeek.com. Agendas. Choose vertical or horizontal formats, type in your activities, and print. Cupcake Toppers. Turn regular cupcakes into festive theme cupcakes. Candy Bar Wrappers. 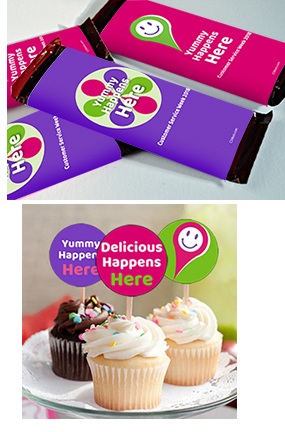 Plain candy bars become Customer Service Week bars (Yummy Happens Here). Photo Booth Props. Use them whenever you’re taking individual and team photos. Table Tents. Choose your size, type in your details, and print. Plus there are Invitations, Stationary, Placemats, and more. You may see the full list of Printables at CSWeek.com. And while you’re there, be sure to click the Shop button to view all of the decorations, rewards, gifts, and stress relievers that we have for you this year. Today, we posted the official Countdown Clock at CSWeek.com. This is a big deal around here because it means that we aren’t counting down months or even weeks, but days until Customer Service Week. It’s also a good time to pause and share some important information and dates. The large order discounts end on September 7. The official order deadline is September 14. Don’t worry, we’ll still be shipping after the 14th, but we will no longer be able to ensure the availability of all items in all quantities, and some rush shipping charges may apply. Customer Service Week is October 1 - 5. The celebration will begin in New Zealand’s tiny Chatham Islands and spread around the globe. So take a moment now to visit CSWeek.com where you’ll find everything you need for your celebration including decorations, rewards, gifts, and stress relievers. Labor Day marks the unofficial end of summer, but before you head out for that final plunge in the ocean or backyard barbecue, make sure you’ve ordered your Customer Service Week celebration materials. It’s just one less thing to do when you’re back in the office, facing the email, voice messages, and projects that demand immediate attention. And, if you’re ordering for a larger group you won’t want to miss the volume discount deadline of September 7. 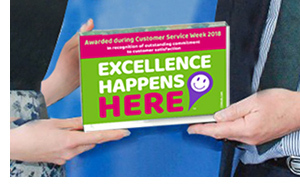 We are delighted to announce three new activities for your Customer Service Week celebration. At CSWeek.com you’ll find a new teambuilding activity called Common Ground, a fun take on vocal skills training with the Tongue Twister activity, and a special recognition activity which lets team members recognize each other. It’s called Recognition Happens Here. You may see the full list of Activities at CSWeek.com. And while you’re there, be sure to click the Shop tab to view all of the decorations, rewards, gifts, and stress relievers that we have for you this year. Friday, September 7, is the last day to take advantage of our volume discounts. We want to help you include everyone in the festivities, from part-time staff, to remote team members, to the departments that you rely on. Volume discounts begin at $500 and will be automatically calculated when you order online at CSWeek.com. So take advantage of the discounts and include everyone in your celebration. You’ll find details on these and other theme days in the Agendas section at CSWeek.com. And while you’re there, be sure to click the Shop button to view all of the decorations, rewards, gifts, and stress relievers that we have for you this year. Whether you need a final activity to round-out your celebration or you’ve just started planning, you’ll find lots of ideas in the Activities section of the CSWeek.com website. Each pre-planned activity includes detailed instructions, a list of materials, and print-outs if needed. You’ll find activities to build teamwork, recognize staff, build service skills, and more. In total, there are 19 activities to choose from. Some are free to all, others are exclusively for CSWeek.com customers, all are fun and engaging. You may see the full list of Activities at CSWeek.com. And while you’re there, be sure to click the Shop button to view all of the decorations, rewards, gifts, and stress relievers that we have for you this year. Customer Service Week provides a wonderful opportunity to break down barriers, build connections, and enhance teamwork. You’ll find details on these and other team-building activities in the Agendas section at CSWeek.com. And while you’re there, be sure to click the Shop button to view all of the decorations, rewards, gifts, and stress relievers that we have for you this year. Pencil and paper puzzles are always popular during Customer Service Week. They’re a great way to relax, share a smile, and build teamwork. And if your team can’t get away from the phones to celebrate, they can still enjoy puzzles right at their desks. We’ve just added three new puzzles to the CSWeek.com website. There are puzzles that highlight consistency, attention to detail, listening, and just plain fun. In total, there are 25 puzzles to choose from. Some are free to all, others are exclusively for CSWeek.com customers, all are fun and challenging. You may see the full list of puzzles at CSWeek.com. And while you’re there, be sure to click the Shop button to view all of the decorations, rewards, gifts, and stress relievers that we have for you this year. 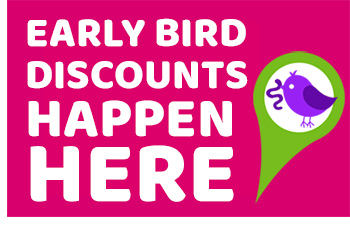 There are just two days left before the Customer Service Week early bird discounts end. I hope that you’ll take advantage of these special savings. When you order by July 13 you will save 10, 15, or 20 percent off your entire order. And best of all, the discount applies no matter what you’re ordering. So if you need decorations and gifts for your department, special "thank yous" for remote staff, or materials for your entire organization, you’ll save. Don’t miss this opportunity to order early and save. I hope you enjoyed the Independence Day holiday. For us, it marks a quiet respite before the "Early Bird Crunch." Between now and the early bird deadline — July 13 — we’ll be processing orders, answering questions, and hopefully helping everyone move along with their celebration planning. 6 days away — you’ll save 10, 15, or 20 percent off your entire order. Sweet! So don’t miss this opportunity to order early and save. The Independence Day holiday is fast approaching. But before your thoughts turn to family gatherings, parades, and fireworks, take a moment to place your Customer Service Week order. It’s just one less thing to do when you’re back in the office, facing the email, voice messages, and projects that demand immediate attention. And, of course, when you order by July 13 you’ll save from 10% to 20% on your entire order, no matter what you choose. So place your order today, take advantage of the early bird discounts, and enjoy the holiday! Last week we shared links to some of the many practical resources at the CSWeek.com website — celebration tips, organizer’s guide, print-and-use materials, plus all of the decorations, gifts, rewards, and stress relievers you need. 13 fun and useful printables including cupcake toppers, candy bar wrappers, photo booth props, table tents, and more. 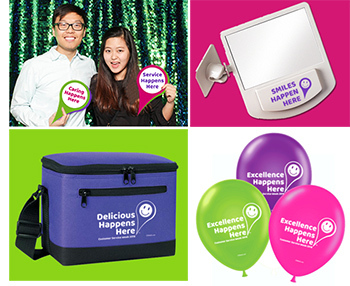 You’ll find dozens and dozens of items for your celebration and best of all, the Customer Service Week theme, Excellence Happens Here™, is carefully woven into each item. So place your order today to take advantage of the early bird discounts and to receive access to all of your free gifts. To make it easier than ever to join the celebration, you’ll find all of the decorations, gifts, rewards, and stress relievers you need at CSWeek.com. Not to mention the downloadable organizers guide, activities, puzzles, printables, and more. You’ll find 25 quick tips to jump-start your celebration planning. Go more in-depth with the Organizer’s Guide. It provides step-by-step directions, a sample agenda, and a timeline for success. You’ll find brief descriptions of some of the most creative celebrations we’ve seen. There are enough ideas here to fill a month-long celebration. There are print-and-use activities to boost teamwork, recognize staff, and build skills, downloadable puzzles, and our popular printables such as photo booth props, cupcake toppers, invitations, and even placemats. 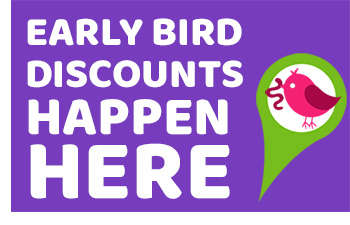 of early bird savings when you order by July 13. It’s just a month away! 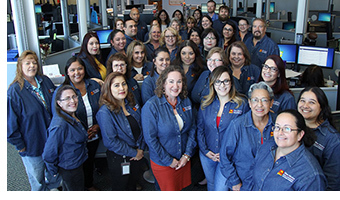 Last week we launched the Customer Service Week website and announced the 2018 theme — Excellence Happens Here™. To compliment that theme, we’ve created fun, meaningful, and easy-to-use decorations, gifts, rewards, and stress-relievers. You’ll decorate with posters, banners, and pennant strings plus signs which highlight event activities such as "Party Happens Here," and "Good Food Happens Here." You’ll give stress-relievers such as our fidget puzzle, stress ball, and timer which is imprinted, "Time Out Happens Here." And, of course you’ll give our water bottles, travel mugs, and coffee house mugs along with coasters, which remind reps that, "Drinks Go Here." To see all of the decorations, gifts, rewards, and stress-relievers visit CSWeek.com because Customer Service Week Happens Here. If there are others on your team who will be involved in planning for the week, now is the time to invite them to sign up for the CSW Bulletin. Or to follow us on Facebook and LinkedIn. We are delighted to present the all new 2018 Customer Service Week theme, logo, website, and much, much more. 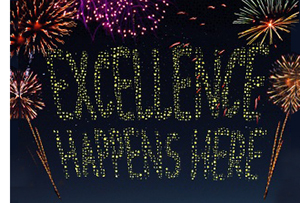 This year’s Customer Service Week theme is Excellence Happens Here™. 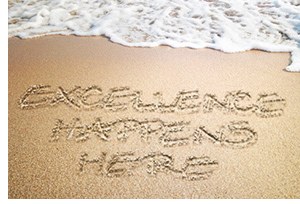 It is a wonderful reminder that wherever we provide service — from the call center to the executive suite, from the loading dock to the home office — that’s where excellence happens. 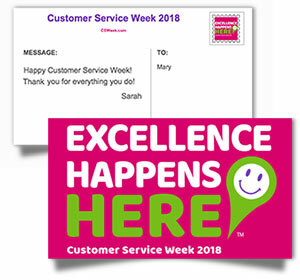 The logo is beautifully reproduced on a wide range of decorations, gifts, rewards, and stress-relievers, which were created exclusively for Customer Service Week 2018. It is also carefully woven through the ready to use Activities, Puzzles, and Printables available at the event website. 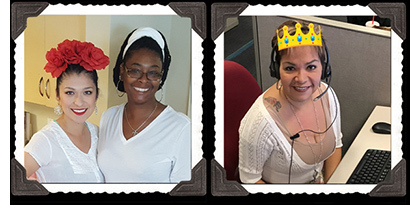 If your team makes Excellence Happens Here™, we invite you to celebrate them during Customer Service Week, October 1-5, 2018. To see the website, products, printables, and more visit: CSWeek.com. The approach of the long Memorial Day weekend marks the unofficial start of the summer season and the official start of the Customer Service Week season. When you’re back from the holiday weekend, watch your inbox for an announcement of the 2018 Customer Service Week logo, and the launch of the 2018 website including new decorations, gifts, rewards, and stress relievers, plus new puzzles, activities, printables, and much more. Wishing you a wonderful long weekend. 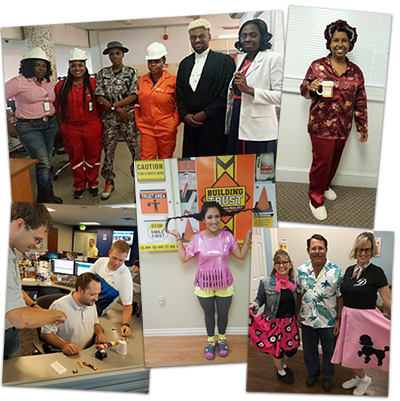 Every year, we ask our customers to share their experiences celebrating Customer Service Week. Food comes up quite a lot in the comments. And why not? A shared meal always helps bring people together. Kim says that the most popular part of her celebration was at the beginning of the week when the team gathered for a "kick-off brunch." For Tina the most popular part of the celebration came at the end when the team enjoyed a catered lunch. This is when she gives awards and prizes that were earned during the week. And Heather includes special meals and snacks every day of the week, "our celebration included bagels on Monday morning, a training video with popcorn on Tuesday and Thursday, nachos and cheese on Wednesday, and on Friday we made our own Sundaes." Whether it’s a pot luck, a cake decorating contest, a catered lunch, or even bringing in a barista for the afternoon, food is a special part of most celebrations. Thank you to everyone for sharing your comments. Next week, more tips from service pros. And while everyone uses them in a slightly different way, teambuilding and prizes are common themes. Cheryl explains, "We have many remote and on-site team members and they feel connected as they attempt to solve the daily challenge. We pass out Dum-Dum and Smarty candies based on their completion of the puzzles. Laughs all around." Mike also says that the puzzles and activities bring his team members together, "They get people to open up and learn more about each other, which builds teamwork when the week is over." And, of course, prizes are always nice. Julia says that in her department, anyone who completes and turns in the daily puzzle is entered into the daily prize drawing. Last year, participants touched on some of the many reasons why they celebrate and the benefits for their service teams. 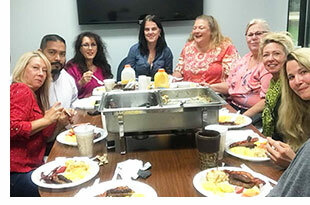 Annette tells us that, "This is a celebration that our associates enjoy very much every year. 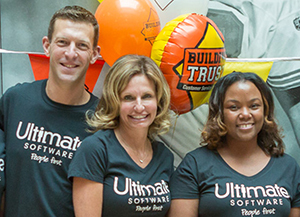 It is great to see all the smiles and hear all the praise for a company that cares this much about its associates." Ann shares many of those same sentiments, "I love celebrating this week and recognizing each employee’s talent and contributions! It is a great way to re-engage disengaged employees, to show appreciation for those who may not receive feedback as often as they wish, and to have FUN in the office all week! We often find during this week that some employees had talents/gifts we were unaware of that could be applied to their position or to the overall success of the firm!" Thank you to everyone for sharing your comments. Next week, more insights from service pros. 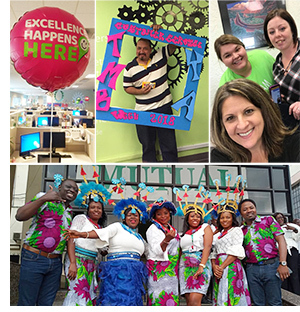 Every year, we ask our customers to share their experiences celebrating Customer Service Week. Together, their responses point the way to a successful celebration. Last year we asked, "If you could share one piece of advice for a successful celebration, what would it be?" The number one response was, "Start planning early." In fact, Kathy says, "Start earlier than you ever thought you would need to. This week is too important to leave anything to the last minute." Lorna agrees, "Start planning by early June by selecting a committee that is energetic and sold on what you want to accomplish. It takes a while to get everyone onboard and committees assigned to do the work needed." It’s true, in a hectic service environment it’s easy to miss dates and to get behind with planning and organizing. So we’ll be sending you lots of reminders in the coming weeks and months, but for now, here are some important dates for your calendar. May 30 Visit CSWeek.com for the launch of the 2018 Customer Service Week website. You’ll find the new logo, new decorations, gifts, rewards, and stress relievers. Plus new puzzles, games, activities, and printables. July 13 Take advantage of the Earlybird Deadline. Order your decorations, gifts, rewards and stress relievers by July 13th to save up to 20 percent off your celebration. September 14 Don’t miss the Regular Deadline. Order by September 14 to ensure availability, and to avoid any rush shipping charges. The Customer Service Week Bulletin has been on a brief hiatus, but with the daffodils blooming outside the windows, we are back. And we have lots planned for you this spring, summer, and right up to Customer Service Week 2018 (October 1-5). The best ideas, tips, and advice from the people who organize Customer Service Week celebrations. Unveiling the new 2018 theme and logo. You’re going to love it! Launch of the 2018 Customer Service Week website including new decorations, gifts, rewards, and stress relievers. Plus new puzzles, games, activities, and printables. Let’s get everyone involved this year! We’ve been sharing highlights of some amazing celebrations. If you missed them, you’ll find them online at the CSWeek.com website and on Facebook. 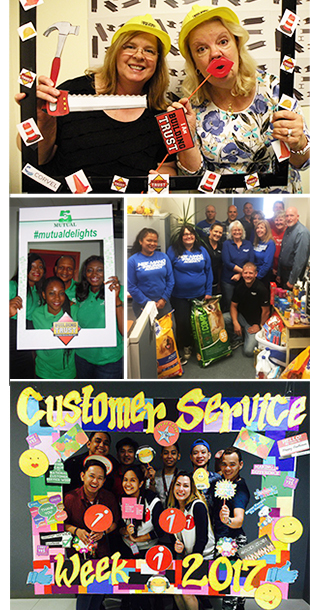 This year service teams from over 60 countries celebrated Customer Service Week. But in at least one case, the celebration had to be postponed. Just a few days before Customer Service Week, we received a note from a customer in Puerto Rico. She told us about the difficulties they were facing as a result of Hurricane Maria, "we have no electricity and we are working with a reduced workforce and operating hours." More than ever, supervisor Lilibeth Heredia wanted to celebrate her team, "We will get back up and celebrate with the rest of the world as soon as we can!," she told us. 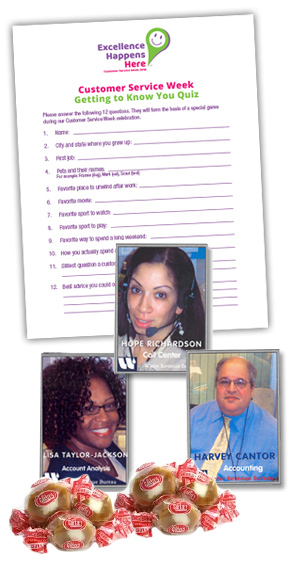 That’s when our service team put their heads together and came up with a plan, we shipped Heredia her celebration materials as soon as delivery services had resumed and we also sent lots more fun items and stress relievers. After all, we could only imagine the stress of their situation and the dedication it took to serve customers under those difficult circumstances. 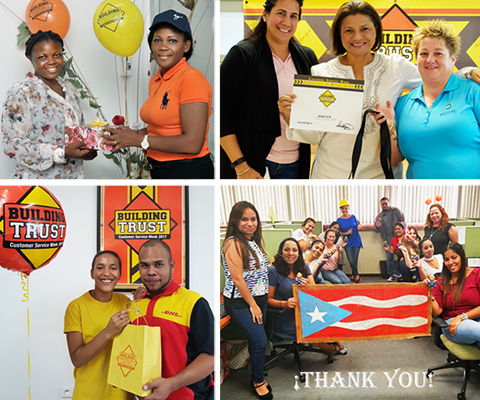 In the photos below, you’ll see service teams from the Cayman Islands, Guyane, Camaroon, and the team in Puerto Rico finally celebrating Customer Service Week. Theme days are always popular and this year we saw some amazing team photos. The 10 locations of Village Family Dental celebrated with Turn Back Time Tuesday, Wacky Wednesday and Pajama Party Thursday. American Pest Control joined the fun with ’merica Monday, Woke up like this Thursday, and Black Out Friday. And, of course, no celebration would be complete without puzzles and games — Everything from paper and pencil challenges from CSWeek.com to bowling, jigsaw puzzles, and more. It’s not too late to share your celebration. Please email me at mdalessandro@CSWeek.com or post to the Customer Service Week Facebook page. Next week more great ideas from Customer Service Week 2017. Service teams often give back to their communities during Customer Service Week, and this year was no different. Many teams collected canned goods for local food pantries and one group even collected much needed items for a local animal shelter. With three offices in upstate New York participating, that’s a lot of kibble. Meanwhile, the service team at Morley showed their team spirit with a timely bake-sale fund raiser to aid victims of Hurricane Maria, which struck Puerto Rico shortly before Customer Service Week. Skill building was also an important part of many celebrations. Videos and trainer-led sessions were popular, but the New Jersey Office of Information Technology took training to a new level. Staff members wrote and acted in training skits that were presented live. The skits were so well done that they were filmed and will be used for in-house training in the future. Photo booths, photo backdrops and even custom selfie frames were also popular this year with many teams posing in hard hats. A huge thank you to everyone who shared photos, video, agendas and other details from Customer Service Week 2017. We will be passing along your ideas and insights as we prepare for Customer Service Week 2018. In the meantime, here in brief, are some highlights to get you started thinking about next year. and even a large display featuring children’s ride-on construction equipment. Teams were also busy with actual building. At Shaw Industries sculptures were built from canned goods, which were then donated to local charities. 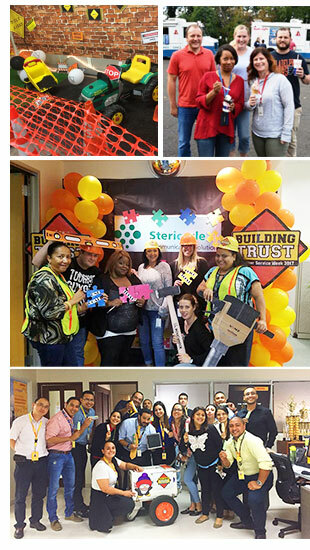 At Systems Services of America, small teams worked together in a Lego building competition. And at Rx Benefits the corridors were filled with teams building bridges out of common office materials. And, of course there was food. People were building pancake breakfasts, ice cream sundaes, nacho platters, and more. Some teams even called in the ice cream trucks.